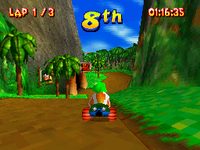 Meandering Mount is an unlockable race course in the game Diddy Kong Racing DS. Along with Thunder Cove, Splashdown Pass, and Strangled Shrine, it seems to be on Donkey Kong Island. As with most of these courses, it is based off of the jungle levels, but is also based off of the mine levels from Donkey Kong Country. The race starts off with a small split path, with grass and and a couple trees in the middle. Shortly after, there is another split path. To the left, there is a mineshaft, and to the right, the dirt road continues, curving to the left to stay parallel to the mineshaft route. In the mineshaft, there is a narrow road with minecart tracks in the middle. Halfway through the mineshaft, there is a boost pad in the middle of the road, as well as a Balloon floating in the air. The mineshaft is made of wood, and is very dark inside due to the yellow colored lights being pretty dim, and pretty spaced out from one another. There are also some cobwebs sticking to the corners to give it an eerie aspect. Once the racers exit the mineshaft, the two roads from the split path join back together in a widened version of the road. There are also some parts of the road that have giant, grassy rocks in them. After some sharp curves winding around the huge rocks, the road narrows like in the beginning, and there is a big downhill with a bunch of trees on the sides. Next, there is another split path with another mineshaft to the left, and the dirt road continues and again curves left to stay next to the mineshaft. The next mineshaft is identical to the first, except for two things. This mineshaft has dim, purple lights hanging from the ceilieng, unlike the yellow lights in the previous mineshaft. And instead of a Balloon in the first mineshaft, it is replaced by an upgrade token. After the racers exit the second mineshaft, there is a short downhill and a couple more small split paths with trees in the middle. The racers eventually reach the finish, and proceed onto the next two laps. This course can only be unlocked by being bought from Taj in his tent. The track did not feature in the original game.